NOTE: Multiple top-level design modules are not supported by Yosys Cicruit Diagrams. The Yosys synthesis flow can create circuit diagrams. Diamond-shaped nodes are wires that are not ports. Octagon-shaped nodes are ports. Elliptical nodes are constant drivers. The label has the format <width>’<bits> or simply <number> for 32 bit integers. The numbers tell you which bits on which side are connected. 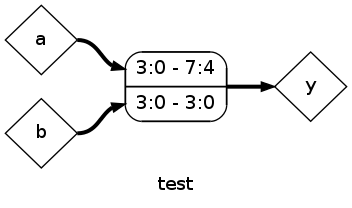 for example ‘3:0 - 7:4’ means that the bits 3:0 from the left net are connected to bits 7:4 from the right net. Usually the box has a single connection on one side and individual connections on the other side. When such boxes are connected to each other or to a cell port, the connections have little diamonds on the ends instead of arrows. That’s because its not an actual connection in the sense of the internal RTLIL netlist format.